Help! My pysanky are messed up! The swirlyness first happened in the yellow, and I thought maybe my yellow was bad, despite being brand new. Yellow seems to be pesky like that. But it happened with the other colors. 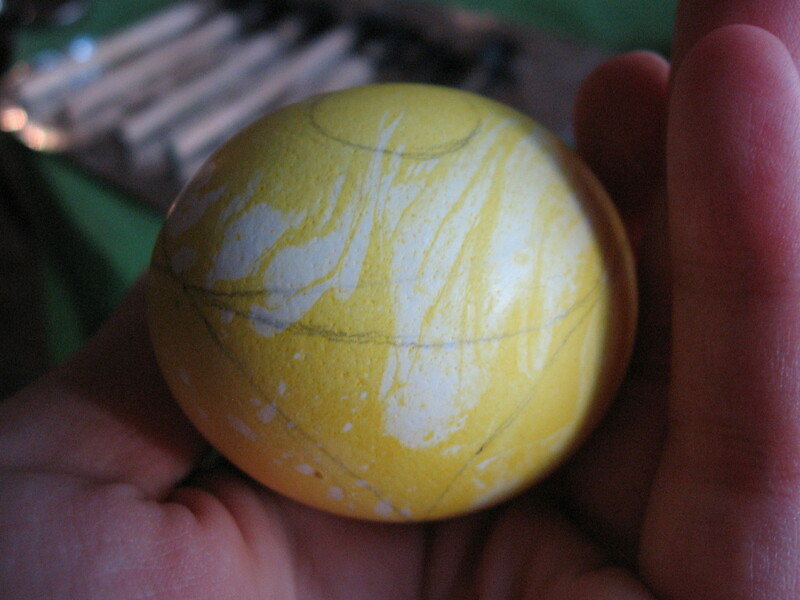 I made the blue egg after this, which came out fine. There was no yellow on that which leads me to believe maybe it IS the yellow, but it’s so strange! I’ve never seen this happen! Today I was working on another egg. Yellow was the first color so I didn’t even use wax before I put it in, but look at what happened! My yellow dye is bad, despite the fact that it’s brand new, and causes the other dyes to not take in those spots when I put them in afterward. I say this because the other day when I didn’t use the yellow, it didn’t happen. The eggs themselves having something on them. This seems to be a stretch since they were from two different cartons. But is there something they do in processing them that leaves a film on it? Something happened from erasing pencil marks with the vinegar solution. I’ve done this my entire life and never had a problem, so I don’t know why it would be causing problems now. Any thoughts on the matter? Responses would be greatly appreciated! Please and thank you!!! February 21, 2010. 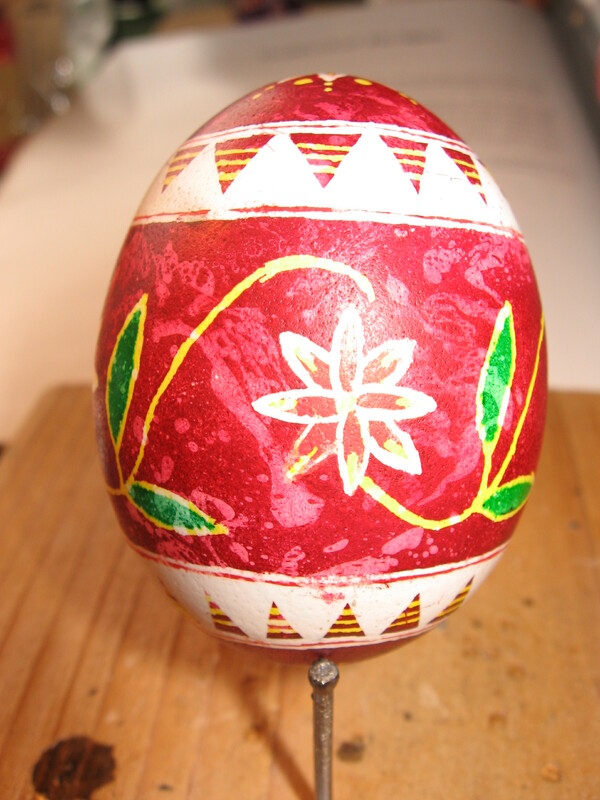 Tags: easter, egg, help, messed, Pysanky, Ukrainian, up. Crafts, Pysanky. Never,ever erase or vineger off pencil marks. Simply correct them when you start waxing. 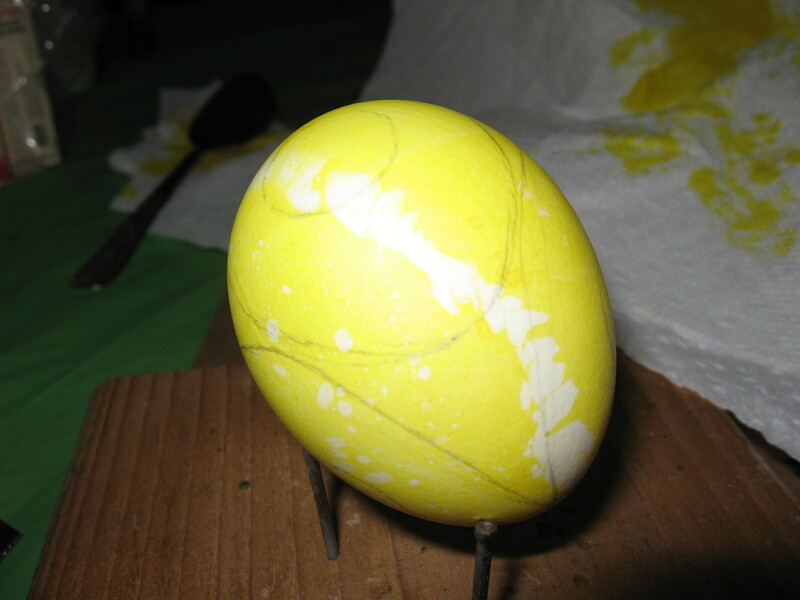 Also be sure to wipe off your white egg with a vinegar solution. Be sure you Are throughly washing your hands BEFORE YOU START. If I am doing a large number of eggs I put them in a vinegar solution about 5 minutes but not much more. This will slightly etch the shell and remove any chemicals used in packaging the eggs. If you get a accidental wax blot it may look removed but it isn’t, Correct mistakes with a marker after your wax is removed. GOOD LUCK. March 16, 2010 at 3:41 pm. Permalink. Thanks for the tips! After making a new dye and having the same problem without doing anything to the egg (I tried dying an egg I hadn’t worked on. Only one that I had soaked in the vinegar solution) I noticed there was scummy stuff in my dye so I ran it through a coffee filter and it works beautifully. I’ve had mold in my dyes after a few years, but never scum in a freshly made dye. I have no idea why that happened two times in a row, but it’s all better now! Thanks again! March 17, 2010 at 12:27 am. Permalink.